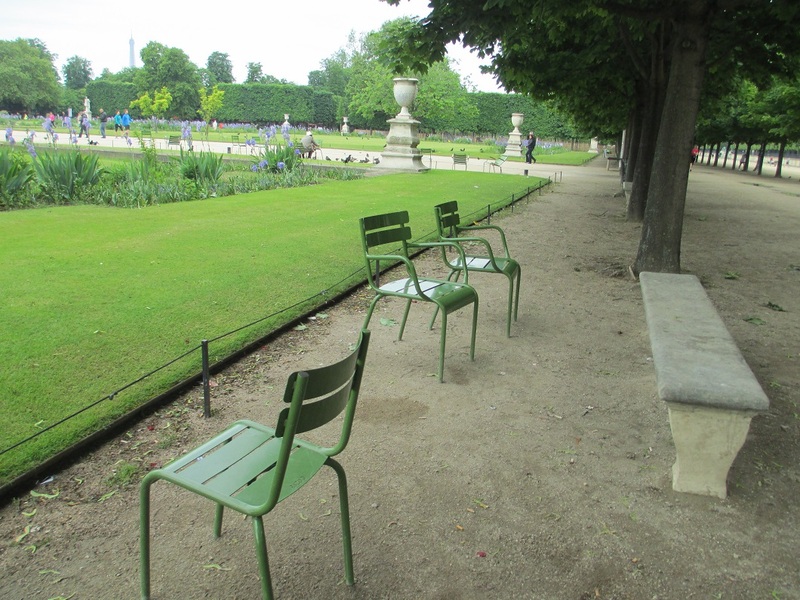 When I was taking a walk through the Jardin des Tuileries in Paris I enjoyed seeing groups of green chairs scattered throughout the park. I liked the arrangement of chairs here because they seemed so casual and friendly, and they were quite comfortable too. When I look at this picture I notice that the middle chair is between two other chairs. It is also between the bench and the lawn. Then I noticed something else. If you look in the upper left hand corner you will see the Eiffel Tower between some trees. It looks like Paris in May provides lots of scenes that fit this theme. For more information about the topic check here. This entry was posted in France, Paris, Travel and tagged chairs, Eiffel Tower, Jardin des Tuileries. Bookmark the permalink. Thank you – it was a nice place to sit and rest! The perfect lawn. Nice gardens. They are some of the prettiest gardens that I saw in France! You captured a lot of “between” in this one! I do too – they are just right for their surroundings! You are right – it is by the Louvre and it you keep walking you end up at the Place de la Concorde. It is a wonderful place to walk! Once you walk across the Place de la Concorde you are on the Champs-Elysees so your memory is correct. It’s a bit of a walk but what a beautiful way to see Paris! I try not to take the metro too much unless in a rush or too far off. The best way to see the city is on foot… and you never know what you may come across. That’s such a good point – walking is a great way to see a city! My feet may not agree, but I have found so many cool places that way that would have been otherwise missed. Thanks – it was fun remembering this scene! I am ready to go sit there now …………all day and into the night to watch the Eiffel Tower lights come on ……….while I sip bubbly all day and eat crepes! That sounds like an ideal way to enjoy Paris. To be in a beautiful park and then see the Eiffel Tower in the evening – perfect! Pingback: Weekly Photo Challenge: Between | The Bohemian Rock Star's "Untitled Project"
very imagitive photo. I sat there many times during my lunch ::) never got a photo like that thought ! yes indeed, magical with so much beauty surrounding you. I even went back to meet a friend visiting from California early in the month. That sounds like a perfect meeting place – it must have been nice! Nice photo, Meg! I’d love to be sitting there. Thank you Shirley – I’d like to be back in Paris too! I would love to be sitting there too! It would be such a nice way to spend an afternoon, or morning, or both! Those chairs look inviting. I like photos of these that show Paris off the beaten track. It’s nice to see the grand tourist attractions, but also to get a sense of everyday life there. That’s something I really like about traveling – it was wonderful to simply enjoy being here! Looks like a lovely place to sit. I see the bench, beautifully placed for a pretty view across the the park. I never pass up a shot of a view from a bench. Benches are put there to encourage you to enjoy the view. I’ve yet to find one facing a blank canvas. I adore Tuileries Gardens. The view of the Louvre from the pond is one I have cropped as a header on my blog from time to time. It is such an unexpected green spot in the city — or leafy autumn jewel. Thanks for taking me back there for a moment.